Now you can attempt as many as 150 questions on the free sample of OMR sheet provided by OMR Home. Making your exam process easy, OMR sheet is a handy tool to practice for your upcoming exams or to give it to your students to test their knowledge. Turning lengthy subjective exam into a convenient objective type exam, OMR sheets are a boon for the educational institutions and students. Verificare the OMR software turns to be your dedicated partner by giving you the freedom to design your very own authentic OMR sheets to effectively assess your candidates. 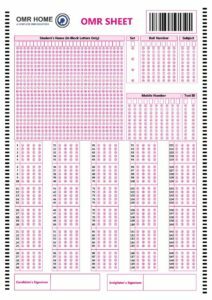 This OMR sheet has got 150 questions in total, divided by 6 rows with 25 questions in each row to be attempted. Every single row has got 5 sets and 4 options named A,B,C,D. The candidates should follow all the basic instructions while filling the OMR sheet and should keep in mind to fill all the correct bubbles without making any error. Previous Post:How does an OMR Software work?